This is a second part of the BizTalk Naming Convention. help to differentiate the objects in the XLang expressions. are some considerations about this ambiguity with Port names. see the port types together with message types. understand what message it is processed. names can be long and can include any symbols as spaces, dots, etc. Icons of shapes give us the useful information. MessageType as a shape name. Do not repeat the type of shape icon by word. Feel free to repeat the shape names. flow, about whole orchestration processing. in the end of names. A sample demonstrates the PGP Encryption/Decryption in pipelines. You can download a code here. Single pipeline component was separated to two Encrypt and Decrypt pipeline components. It simplifies the pipeline configurations. Configuration parameters are stored in SSO, which, I hope, improves security. File names for temporary files are regenerated randomly each time. That eliminates errors in case when temporary file names are based on the inbound file names and pipelines are working simultaneously in several ports. Configuration includes a config file for a SSO Config Store utility created by Richard Seroter. Send and Receive pipelines for Decryption. Encrypted files are created in a Test\Encrypt\Out folder. Decrypted files are created in a Test\Decrypt\Out folder. First: A Disclaimer. Do NOT attempt this in your production environment.You risk loosing data. We had an issue in a test environment where the Backup BizTalk job was not configured and had caused the log files to fill the disk to it's limit. The data in the environment wasn't important and destroying a coherent backup chain and point in time restore was not a big deal. We just needed to get the environment back fast to allow test to continue. I quickly wrote and ran the script below that does the job of truncating BizTalk Servers log files to make the environment functional again. Be aware that this will break the coherence of the log backup chain. To get a point in time that you can restore to you could opt to take a full backup immediatly following this operation if that is important to you. Before running this script you should stop all services that uses the database and make sure that all connections are closed if you want to make sure that your databases are left in a transactionally coherent state. Keep in mind that this is just a sample, add and deduct databases as needed, change the name of log files etc. Once done restart the BizTalk Services and you should be good to go. You really should, as a first, second and third option, configure the Backup BizTalk job to stop unchecked log file growth. The backup job will make sure that log files don't grow out of control. You will however need to set something up to clear away the backup files created instead. Here is one option for doing that. There is also something you can do to reduce the size of the log files – enable compression. You can read more about that here. This log file growth happens because BizTalk Servers databases by default uses the FULL recovery mode. Setting the BizTalk Server databases in SIMPLE mode permanently is a so-so idea. If you really do not need and will never do backups and understand that restore or recover in this case will mean re-install and start from scratch, then ok. If that is not the case, then SIMPLE mode is a bad idea. You can read more about why here. I'll give a hint though – DTC transactions. This is just a log post of a script I put together. When setting up a plattform we are not always certain what hosts and handlers the customer wants. We usually set it up according to common requirements and best practices. In that case it's also interesting to see what hosts are indeed used and not used once the solution is deployed, so you know which ones can be removed if requested. This is a sql script for that. Although this information can be found out using the Administration Console these kind of reports are not easy to get out and there is no one view for it. It's much easier to access the database BizTalkMgmtDb directly for these things. One area here is not so well documented. 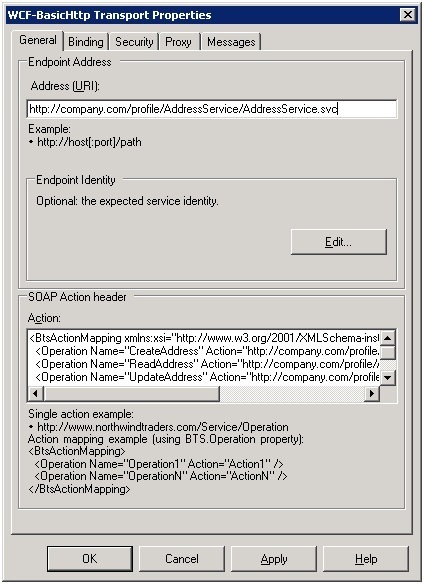 When we are filling in the Transport properties for WCF adapter, we see the SOAP Action header section. What is it? Where we could take the values for Operations and Actions? If we use the Consume WCF Service wizard, this section is filled up automatically. But sometimes we have to fill it in manually. Open a WSDL for the Web-service and search for a binding section. If you add the “?wsdl” to the Web-service URL, usually the Web-service WSDL is opened. NB: this post contains screen shots for the links. Please follow the links to get the most recent and up to date information. NB: ce billet comprend des copies d’%u00e9crans mais pour les liens. Il est conseill%u00e9 de cliquer sur les liens pour avoir les informations les plus %u00e0 jour. This list is not exhaustive. Please feel free to provide additional valuable links by commenting this post. La liste n’est pas exhaustive. N’h%u00e9sitez pas %u00e0 fournir d’autres liens importants en laissant un commentaire. http://azurescope.cloudapp.net/ by an MS Research group contains a lot of micro benchmarks. Note that this site should be shut down quite soon as the results are quite old and performance characteristics may have changed since then. http://azurescope.cloudapp.net/ cr%u00e9%u00e9 par un group de MS Research contient un bon nombre de r%u00e9sultats de performances atomiques. Il est %u00e0 noter que ce site devrait %u00eatre ferm%u00e9 bient%u00f4t puisque les r%u00e9sultats sont assez vieux et pourraient %u00eatre diff%u00e9rents aujourd’hui. Windows Azure compute performance are described thru the virtual machine characteristics that can be found in the MSDN documentation. Les caract%u00e9ristiques performance de la partie ex%u00e9cution de Windows Azure sont d%u00e9crites via caract%u00e9ristiques des machines virtuelles que l’on trouve dans la documentation MSDN. The Windows Azure Storage team wrote a blog post on their former blog (they now have merged with the Windows Azure blog) about their scalability targets. L’%u00e9quipe du stockage Windows Azure a %u00e9crit un billet sur son ancien blog (qui a maintenant fusionn%u00e9 avec celui de Windows Azure) %u00e0 propos de leurs cibles en termes de passage %u00e0 l’%u00e9chelle. They also wrote on how to get the most out of Windows Azure Tables. SQL Azure Performance and Elasticity Guide on TechNet Wiki provides information about optimizing an application developed against SQL Azure. Le guide de performance et d’%u00e9lasticit%u00e9 de SQL Azure sur le Wiki TechNet fournit des informations sur l’optimisation d’une application qui utilise SQL Azure. The following case study is about using many SQL Azure databases to sell 150 000 tickets within 10 seconds. Le t%u00e9moignage suivant est sur l’utilisation d’un grand nombre de bases SQL Azure pour vendre 150 000 tickets en 10 secondes. Service Bus is typically an asset that needs to handle a given number of messages per seconds. This and other performance characteristics are to be taken into account. This is described in this guidance page in MSDN Library. Le bus de service est typiquement un composant qu’on utilise avec un certain nombre de messages par secondes en t%u00eate. Cela ainsi que d’autres caract%u00e9ristiques de performance sont %u00e0 prendre en compte. Cela est d%u00e9crit dans le guide sur le sujet, dans la documentation MSDN. Windows Azure Caching has some usage quotas which are described in MSDN documentation. Le cache distribu%u00e9 de Windows Azure a des quotas qui sont d%u00e9crits dans la documentation MSDN. MSDN Library also provides guidance on how to calculate what the application will need. La librairie MSDN fournit aussi guide pour calculer les besoins de l’application en la mati%u00e8re. At the end of the day, it is important to get an idea of how your application behaves on the platform. For that , load tests are an important step to consider. Load tests injection can be done by the cloud itself as explained in MSDN library Au final, il est important que vous ayez une id%u00e9e de la fa%u00e7on dont votre application se comporte sur la plateforme. Pour cela, les tests de charge sont une %u00e9tape importante %u00e0 prendre en compte. L’injection des tests de charge peuvent se faire depuis le cloud comme expliqu%u00e9 dans la librairie MSDN. One of the often used examples is the WordCount example. Un des exemples les plus utilis%u00e9s est le comptage de mots (WordCount). – the mapper function emits each word found as a key, and 1 as the value. – Thus, you get each word and the number of occurrences as a result of the map/reduce. – la fonction mapper %u00e9met chaque mot trouv%u00e9 en tant que clef, et 1 en tant que valeur. – Ainsi, on obtient comme r%u00e9sultat du map/reduce chaque mot et le nombre d’occurrences pour ce mot. We also need to have some data. For that, it is possible to download a few books from the Gutenberg project. On a %u00e9galement besoin de donn%u00e9es. On peut par exemple t%u00e9l%u00e9charger quelques livres du projet Gutenberg. NB: for large volumes of data, FTPS would be a better option. Please refer to How To FTP Data To Hadoop on Windows Azure. NB: pour de grands volumes de donn%u00e9es, FTPS est pr%u00e9f%u00e9rable. cf How To FTP Data To Hadoop on Windows Azure. Let’s create a folder and upload the 3 books into that HDFS folder On cr%u00e9e un r%u00e9pertoire HDFS et on y charge les 3 livres. It is also possible to have a more complete console by using Remote Desktop (RDP). Il est %u00e9galement possible d’avoir une console plus compl%u00e8te en se connectant au bureau %u00e0 distance. I've uploaded a new version of the bLogical.BizTalkManagement restore powershell commandlets originally posted by Mikael. The updates are minor and adress the parsing of filenames and cleanup of the code to get rid of some god intentions that never became more then intentions, aka unused code. If you have no idea what I am talking about, feel free to read the original article and give them a try. We are using these heavily for customers instead of log shipping and it really makes the whole process of restoring your databases easy. In this blog post we are going look at how to manage routing in the new Azure ServiceBus EAI CTP. As a scenario, I’m going to send a request for information (RFI) to some of my fellow MVP’s. To do that, I’m going to create a One-Way Xml Bridge, to receive the messages. After receiving the RFI message I tend to route it to one of three queues. If you haven’t already downloaded the SDK, you can do this here. After you’ve installed the SDK, you can sign in to the labs environment using a Windows Live ID. Open Visual Studio 2010, and select Create Project. In the list of project templates, select ServiceBus, and Enterprise Application Integration. Give it a name and click Ok.
Right-click the project and select Add->New Item. At this time there are two types of artifacts you can add; Schemas and Maps. Select Schema and sett an appropriate name. In my case I set the name to RFI.xsd. Continue building up your schema. Notice, you don’t have to promote any nodes as you’d have to do in BizTalk. Double-click the BridgeConfiguration.bcs and drag a Xml One-Way Bridge from the toolbox to the canvas. This is going to be your entry point to your process, similar to a Receive Location in BizTalk. Set the name appropriately, and notice the Router Address which is going to be your endpoint in Azure ServiceBus. As stated before, the incoming RFI message is going to be routed to any of the three queues. You might not your message relayed to a queue, and could there for use any of the other Destinations such as Relay– or External Service EndPoints. Either way, the principle of routing is the same. Connect the Bridge with all Destinations. Next we’ll define the incoming message type(s). Double-click your Bridge (ReceiveRFI in my case). Click the plus button in the Message Types stage. Select the Message Type you created earlier, and click the arrow button on the right. This is the interesting step, where we are going to promote some fields in the payload so that we can route on these in the next step. First open your schema and select the node you care to use for routing (in my case Receive). Copy the Instance XPath from the Property window. Then double-click the Bridge, select either of the Enrich stages, and then click the Property Definition button in the Property window. There are two Enrich stages, as you might be using a Transformation, in which case you might want to promote fields from either the original message or the transformed message. For more information about transformations, have a look at Kent’s post. Set the Type to XPath, and paste the XPath expression in the Identifier text box. Select the Message Type and set the name of the property. Finish be setting the data type and click the Add button (+). Close the dialog by clicking the Ok button. As you have promoted your property (or properties), you’re now ready to set the Filter Conditions on each of the Connectors. Select one of the selectors and type the Filter in the Property window. Eg. receiver=’SteefJan’ or customerId=1234. Before we deploy the solution, you need to create the queues. There are several tools for this, but with the samples comes a MessageReceiver project you can use. After creating the queues verify they are created in the portal. Right-click the project and select Deploy. Supply the secret. There are a lot of reasons why the 2011 holiday season is a great time to take a look at Azure development. There are a number of offers and releases that allow you to start to explore cloud-based development on the Microsoft platform, best of all; they are all pretty much free to take advantage of. Ever since the introduction of billing for Windows Azure it has always been an issue for many developers wanting to learn Azure that, if you are not careful, you can easily run up charges on the trial accounts when going above the free quotas. With the “$0 spending limit” available on 90 day trial and MSDN accounts Azure development developers can start to explore the Azure platform without fear of an unexpected bill at the end of the month. You will, however, have to enter credit-card details. It is great to see this option available, I know it is something that developers have been clamoring for ever since billing was introduced on the platform. Hopefully this will be extended to a fixed-price limit on Azure billing at some point in the future. The Azure Service bus provides brokered and relayed messaging capabilities hosted in Windows Azure datacenters. Launched in CTP in 2007 under the name of “BizTalk Services”, then re-branded to “.NET Services”, “AppFabric Service Bus”, and now “Azure Service Bus” the messaging services are a great way to explore the capabilities of Azure when creating hybrid (part cloud, part on-premise) applications. I’ve spent a lot of time exploring the brokered messaging capabilities of the service bus and am very impressed with the functionality provided. With four months of being above to use the services for free (data transfer charges still apply), now is a perfect time to gain some experience of using the technologies, or even create a small proof-of-concept application in your organization. As “AppFabric” has been dropped from these branding of the service bus I’ll be re-branding the title of the book in the next release. If, like me, you have been following the long and winding roadmap of BizTalk Server, and want to get an early insight into what “BizTalk vNext” will look like, now is your chance. The first CTP of Microsoft’s cloud-based integration capabilities has been released and is available to use in the AppFabric Labs environment. As the technology is in developer-preview mode, it’s free to use, no credit card required!